Among the new challenges facing Ohio State and Urban Meyer in the wake of the program’s first loss in two years is finding a replacement for Everett Withers, who’s leaving after two seasons as Ohio State’s co-defensive coordinator and safeties coach to become the head coach at James Madison. The 26-year coaching veteran had spoken publicly of his desire to be a head coach, so the move is not a huge surprise to Meyer. But Ohio State’s defense struggled down the stretch, so it’s now fair to wonder if this change will be one of many Meyer makes between now and next season. That answer probably will come later rather than sooner. The focus in Columbus now is on preparing for the Jan. 3 Orange Bowl; in addition to recruiting when the Buckeyes aren’t practicing, Meyer will now be searching for a replacement and pondering options. As for the Orange Bowl vs. Clemson, the Buckeyes will pretty much have to play the hand they’ve been dealt. Withers was Ohio State’s only assistant coach who wasn’t from Ohio. Meyer often joked that Withers "wishes he was." What that really means or meant is unclear; Meyer’s staff and body of work through two years rate well with Ohio fans. In recruiting, the loss of Withers is undoubtedly a loss for Ohio State. He was instrumental in securing the late commitment of five-star safety Vonn Bell out of Georgia last year, and his track record and relationships in the South were extremely valuable. 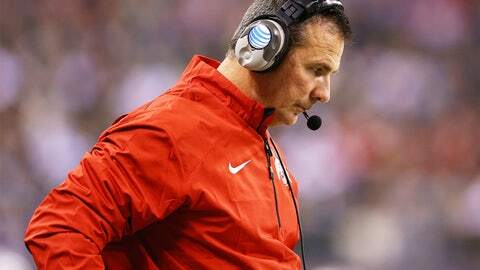 Meyer is used to having assistants leave and having to shuffle coaches and priorities. Recruiting — and recruiting the South — will remain a priority. Meyer has vowed there would be defensive changes, meaning better results, but it remains to be seen if that means scheme changes. There are still head-coaching jobs open across the country, and could be more after bowl season. More Ohio State assistants could be candidates for those jobs. Meyer will be prepared. When he says he worries about everything, he means it. And when he says he’ll get the defense fixed, his track record says he will.